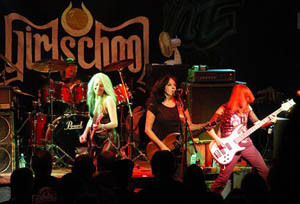 The all-girl classic rock band Girlschool have been recording and touring for over 25 years now. Last year they released a new album �Believe� and recently toured with Vixen and supported Motorhead, the latter at the Hammersmith Apollo. 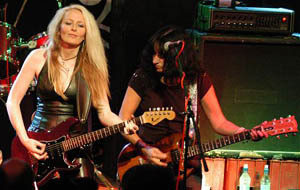 Guitarist Jackie Chambers and drummer Denise Dufort answer a few questions. The recent Mean Fiddler gig went down a storm and you all looked really happy. Did it feel that way? Absolutely, we were loving every second. The crowd was enthusiastic which always makes it a pleasure, we had a great stage sound and the crew at the Mean Fiddler were all fantastic so the whole evening was enjoyable to us. Also after playing a lot of gigs abroad recently it was great to finally play a home town venue. The new material sits well next to the older stuff live. Are new and old equally comfortable to play? We love playing the older songs as we know the audience�s are more familiar with them but when we get a chance to play new material it�s exciting to us as it�s still so fresh. I�ve only been apart of the band for about 6 years now so the older songs are still fairly fresh to me, where as Kim and Denise have been playing Demolition and Emergency for years and years now. I know they still enjoy doing those songs but the new material must be a welcome change for them. Thanks! We all felt we had a really good album in �Believe� and we were very disappointed with the distribution of the CD. We do have plans to re release it this year along with a DVD of extras footage of the band on tour, lot�s of silly bits of us backstage and travelling. Let�s hope that this time anyone wanting to buy the CD will actually be able to do so. This year we�re concentrating on getting the Believe album and DVD dual package back out there as well as the Motorhead support your which we�re all looking forward to, next year if all goes well we should be back in the studio again. How did the current line-up come together? Well Girlschool has never split up at any point. So Kim and Denise have always been around with various members. I met Kim in 1995 and we did a little writing together as a sort of side project, meanwhile Kelly Johnson had wanted to leave the band after recording one last album, so it was sometime after that that I joined and Kim thought that it would be good to have Enid Williams back in the band, so in 2000 we started to gig and then record again and finished off the last album Tracey Lamb and Kelly Johnson had been a part off by adding 2 new songs to it before it was released. What are your favourite Girlschool albums? I personally loved the �Not the Innocent� album I thought there were a few great songs on that album and I love Hit �n� Run too, of course I�d have to say Believe too but then I�d be extremely bias. Play Dirty as it has a more mature sound to it and I think it sounds a bit like Def Leppard, also Jim and Noddy from Slade produced it. 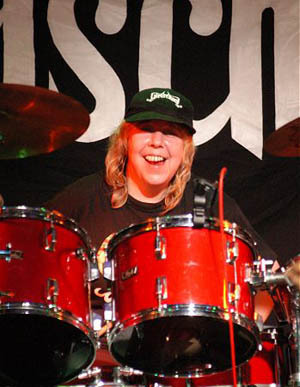 What are the best memories of Girlschool over the years? Meeting AC/DC and then all of them coming back to my parents house for a huge party. The past 6 years have been great fun and there�s been a lot of good memories, I think my favourite gig so far has to be the Sweden Rock festival in 2002 I loved that gig but the after show party was something else thanks to Motorhead. What�s your view on the current state of the music industry? I think at this moment in time things are looking up slightly with the sudden interest in guitars again. For years now it�s been all this manufactured garbage that has had no staying power at all but there seems to be a few decent guitar bands appearing on the scene and making real instruments credible again. The sooner we can get back to real and not manufactured music all the better for the industry and with the introduction of downloads to the singles charts I think we�re finally starting to see Independent bands getting a chance to shine through. How do you feel the back catalogue has been handled? Any plans for Running Wild? Sanctuary has recently taken on the back catalogue and released most of the albums as double packages, I don�t think there�s any plans at this current time to re release Running Wild but you never know. We�ve just seen on the net that the Running Wild DVD has been released but we�re not sure if that�s a bootleg or not. Yes CHEERS for your continued support and for being the most loyal fans ever.